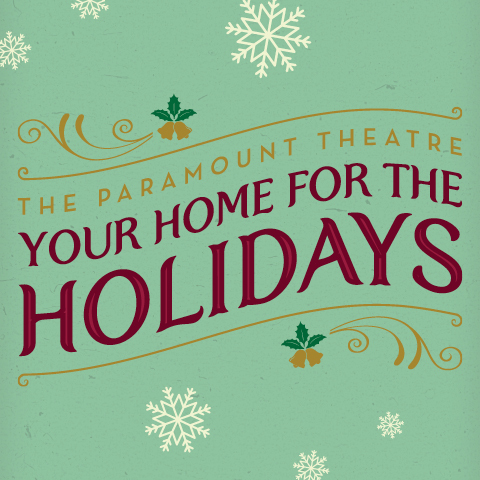 Celebrate the season in the decked out halls of the historic Paramount Theatre all December long with live holiday music, a pub run full of beer and cheer, and your favorite classic films. Every holiday season, the Jazz at Lincoln Center Orchestra with Wynton Marsalis brings this Grammy Award–winning holiday extravaganza to venues across the country, and we are thrilled to have them back at the Paramount after many years. With soulful big band arrangements of songs both sacred and secular, Big Band Holidays is an uplifting tradition enjoyed by audiences of all ages and backgrounds. We are looking for other humans that share our affinity for elf culture! Grab all your buddies and meet at the Paramount. From there, we’ll “pass through the seven levels of the Candy Cane forest, through the sea of swirly twirly gumdrops…” to a destination TBA for some Elf-themed fun. Then we’ll make our way back to the Paramount Theatre for more festivities in our Gimbels department store lobby including specialty cocktails, a Throne of Lies, and more surprises, followed by a screening of Elf. Pub Run participants will also receive two tickets good for beer, soda, or popcorn once back at the theatre. Plus, you’ll leave with other goodies. Be sure to enter the Elf costume contest! The top 3 costumes will receive prizes! In the course of Chris Isaak’s career, he has released nine extraordinary albums, twelve singles, been nominated for two Grammy awards, acted in several motion pictures and starred in his own critically acclaimed TV series. His legendary shows with his longtime band Silvertone have entertained tens of thousands of people for over two decades. We can’t wait to welcome Chris Isaak back to the Paramount Theatre for his 2018 Holiday Tour! Ian Moore returns to the State Theatre for the his 2nd annual Family Christmas show. Rare songs and special guests will be in store. Known to Austin music fans since his teenage years playing the clubs here, Ian Moore had an attention-getting stint in Joe Ely’s band that helped lead to his own record deal with Capricorn in the early 1990s. Since then, he’s released nearly a dozen albums and several EPs, including the new Toronto on Last Chance Records. The resident Santa at the most famous department store in the world claims to be the real Kris Kringle and is institutionalized as insane. When a young lawyer decides to defend him by arguing in court that he is actually Santa Claus, everyone’s beliefs are put to the test. A true holiday classic featuring Edmund Gwenn’s immensely charming performance as perhaps the screen’s best ever Santa. The Paramount is proud to celebrate this Christmas classic on glorious 35mm film! Since the early 1970s, Murphey has left an indelible mark on the American Music Landscape crafting and recording iconic hits. In the process, he has topped the pop, country, bluegrass and western music charts, earned six gold albums and multiple Grammy nominations. His Cowboy Christmas shows are beloved annual events, and we are honored that he chose the Paramount to celebrate 25 years of this holiday tradition in Austin. Shane Smith & the Saints unleash a spirited, four-part harmony sound at every show. Hints of folk, rock, country and Americana all shine through an aggressive, rootsy fiddle beat stew — this is a unique holiday outing you won’t want to miss. From their home base in Austin through performances across the country, these five gentlemen have not just stuck stubbornly to their musical and lyrical convictions. They’ve defied audience expectations by delivering incendiary shows since their latest and most ambitious release, Geronimo. The party of the year will be here before you know it! If you’ve never been at the Paramount Theatre to ring in the New Year with Bob Schneider, it’s time you experience why this night of champagne and surprises is an enduring annual tradition. From “Tarantula” and “40 Dogs” to tracks from his latest album, Blood & Bones, Bob has proven time and time again why he’s one of Austin’s most beloved artists. This show and party combo is the best way to see 2018 out in style while ensuring your first moments of 2019 are unforgettable.